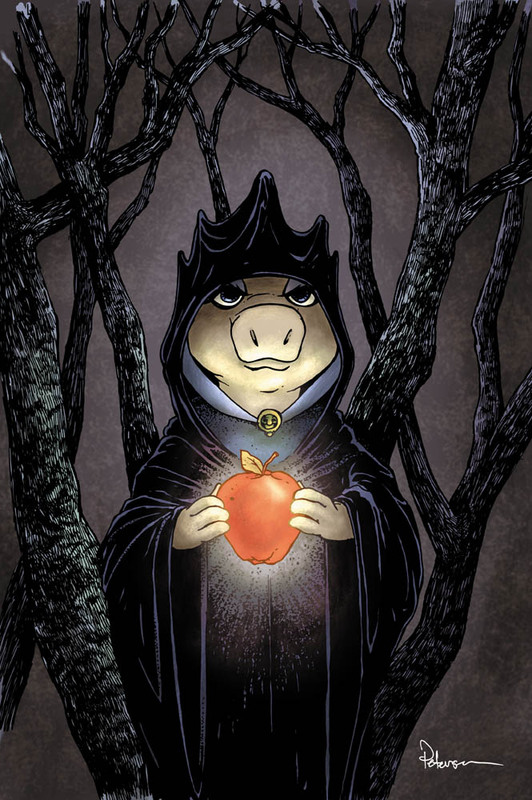 Here is my cover for Muppet Snow White #2. This cover was not used for solicitation (one of those instances where I was not able to get the cover completed by the solicitation date) but it will be printed as cover A on issue 2. On this one I was able to get the sketch, pencils, and inks done quickly and without much pain, but the colors were an endless tweaking job. At one point it was much more blue overall with a green (poison) apple. Julia suggested a different palette and to make the apple red. I think the cover is better for it. As I said above, the sketch and drawing for Snow White #2 was fairly straight forward. I started with a thumbnail (lower right corner) and then started drawing a more finished version. You may notice that I did not draw the right eye or hand. Since I was going to scan this and resize it to fit the final art size, I could just copy and mirror those features from the right side. The trick when mirroring these things is to alter them slightly. If a drawing is too symmetrical, it doesn't look right. This is also a rare instance of me doing rendering on a drawing intended for ink, but I wanted to plan out some of the lighting at this stage that I would ultimately realize in color. I used my late 70s Fisher Price Piggy puppet as a lighting reference. I got a few advance copies of the Mouse Guard/Fraggle Rock book, so I was able to take a sneak peak and it looks great! I am honored that Archaia included me in a Free Comic Book Day offering and I hope fans enjoy it as well. Fan Art:Mikaël Morin-Hamelin is an animation student in Quebec who emailed his fan art to me. 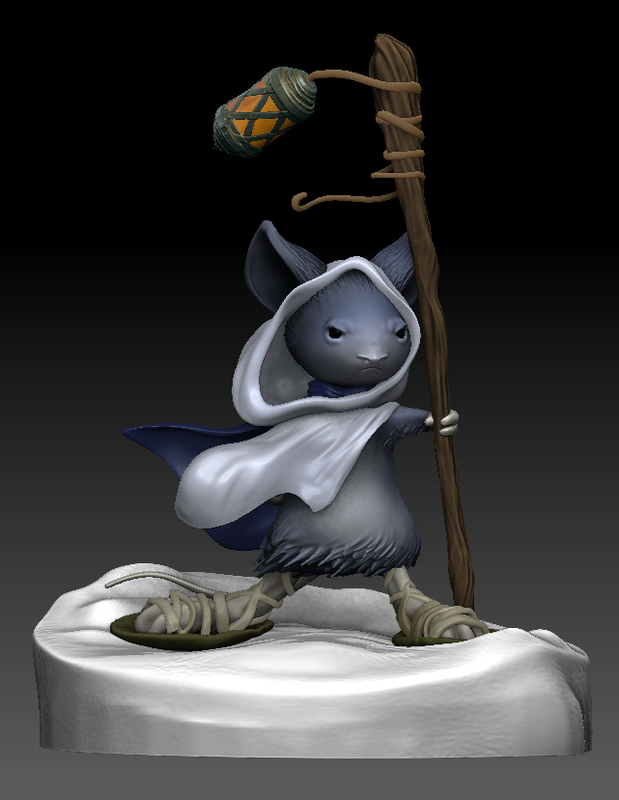 It's a 3D rendering of Kenzie in his Winter gear. Great job Mikaël! Mouse Guard trailer:The good folks at Archaia & Kunoichi put together a trailer for Mouse Guard which debut at C2E2. 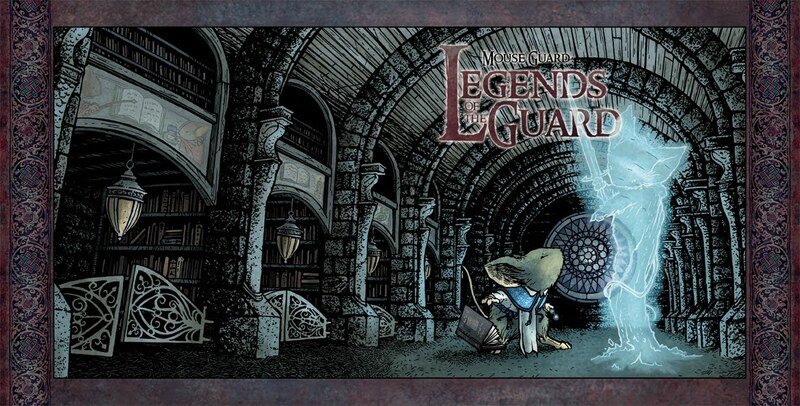 BEST GRAPHIC ALBUM – PREVIOUSLY PUBLISHED : Mouse Guard Winter 1152 & M0use Guard Fall 1152 Black & White limited ed. 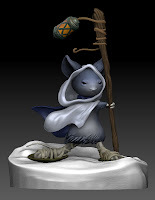 SPECIAL AWARD FOR EXCELLENCE IN PRESENTATION : Mouse Guard Winter 1152 & M0use Guard Fall 1152 Black & White limited ed. The Harvey's are nominated and voted on by popular vote, so every vote counts. Click Here to start voting. 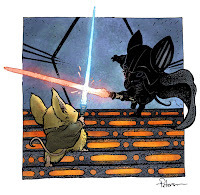 Issue 2 of the Mouse Guard Anthology is now in previews (order code: APR10 0733). Here is the full cover for the issue (perhaps my favorite for the series). This issue will feature stories by Gene Ha & Lowell Francis, Sean Rubin & Alex Kain, and Terry Moore! 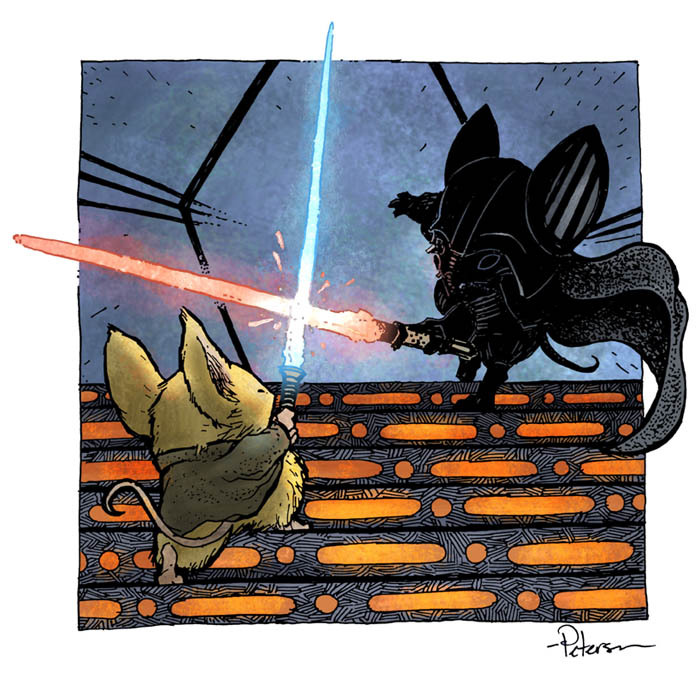 I had a great time coloring this one because of the lighting of the sabers & the stairs. This weekend I'll be at C2E2. I'll be set up at the Archaia booth (#545). 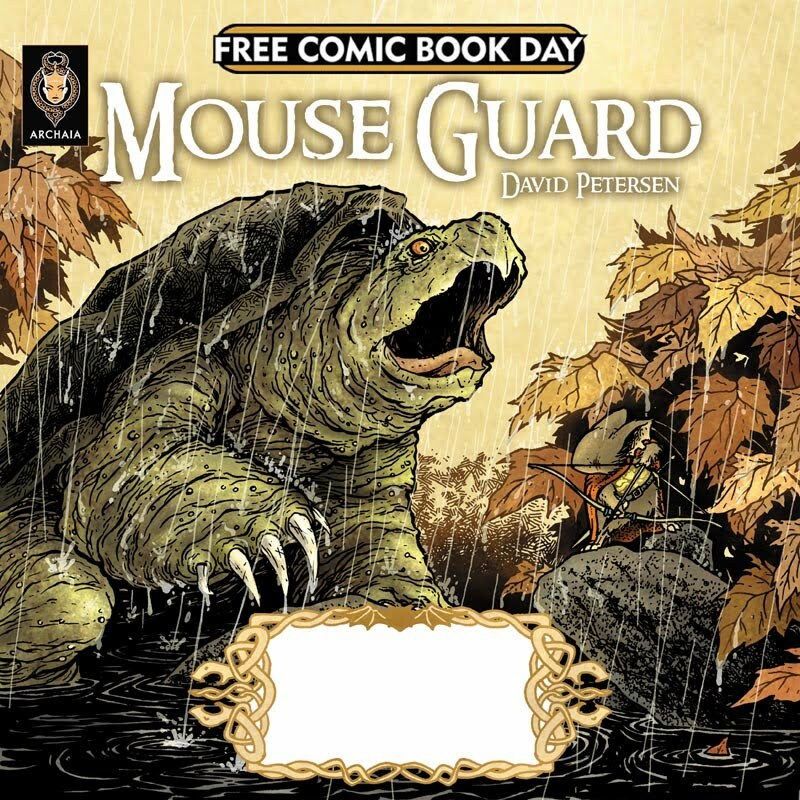 Archaia will have Mouse Guard books for sale, I'll be signing and meeting fans. Hope to see you in Chicago! For a while it looks like I'll be doing shorter blogposts. With a current lack of ready-to-go material I can share, coupled with months of impending deadlines, I don't have as much to contribute on a weekly basis. 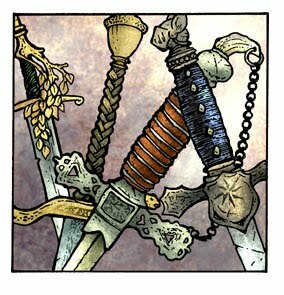 I still plan on some doing some special, topical, and unique posts (like interviews with all the Legends of the Guard creators!). 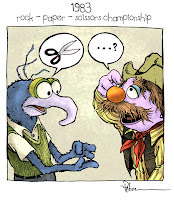 At the Comic Geek Speak Supershow there was a fan who had a sketchbook of all Muppets vs Sesame Street characters. 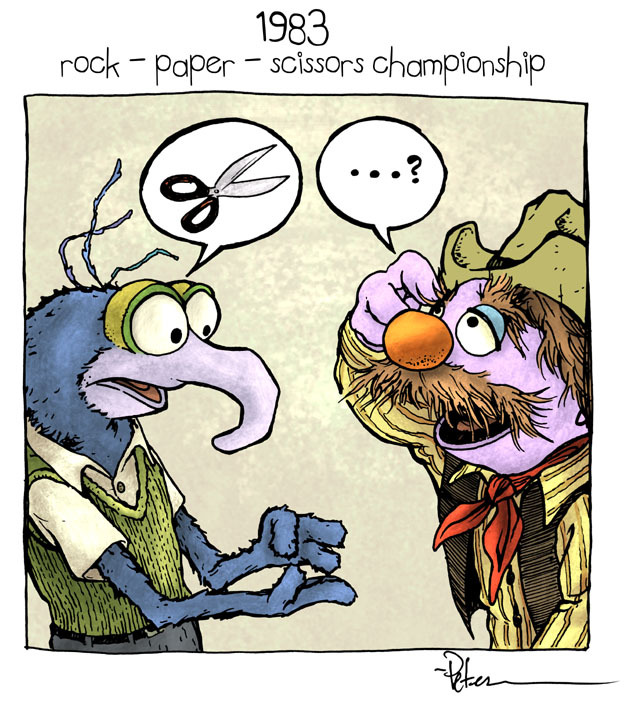 There were a lot of really clever ones (Piggy vs The Count in a Buffy homage, Pigs in Space vs the Yip Yip aliens, Kermit from the Muppet Show vs Sesame Street News reporter Kermit...) I opted for a bizarre match of rock, paper, scissors between the Great Gonzo and Forgetful Jones. This week's fan art is from gamer Donnie Chase who has done a number of character portraits for his Mouse Guard RPG group. This one is named Hudson.